A huge thank you to Lauren for asking me to participate in the Guest Blogger Before & After series. I couldn't help but think after she uploaded my post w/these very scary pepto bismol pictures of my master bath that she might have second thoughts about having asked me. (I can't even believe I'm letting people see this!) 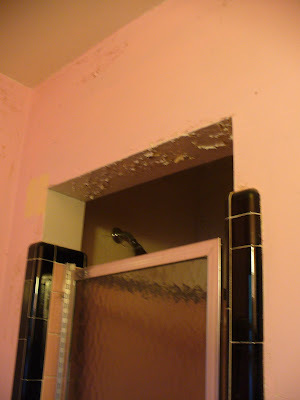 And, here's what's even scarier - we lived with this bathroom for 10 years (!) although the crazy peeling paint problem happened within the last 6 months. These pictures were taken in the midst of sanding and scraping, just before all the fixtures were removed. The previous owners had leveled the "vanity" with pennies. The room is 4' w x 5' d with a shower off to the right side. 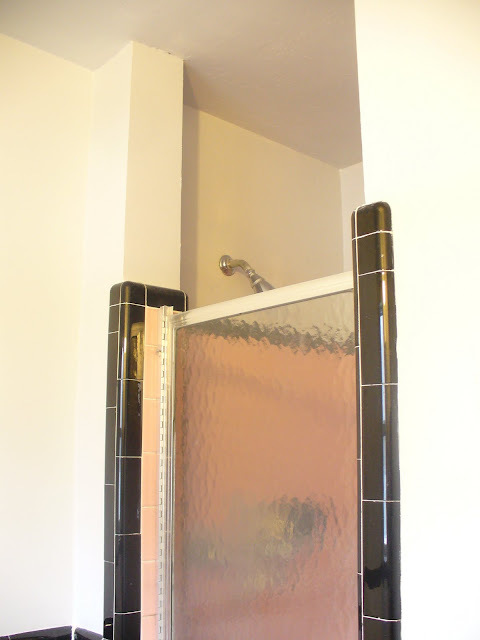 The overhang to the shower trapped in steam and made the 30" square shower feel even smaller. 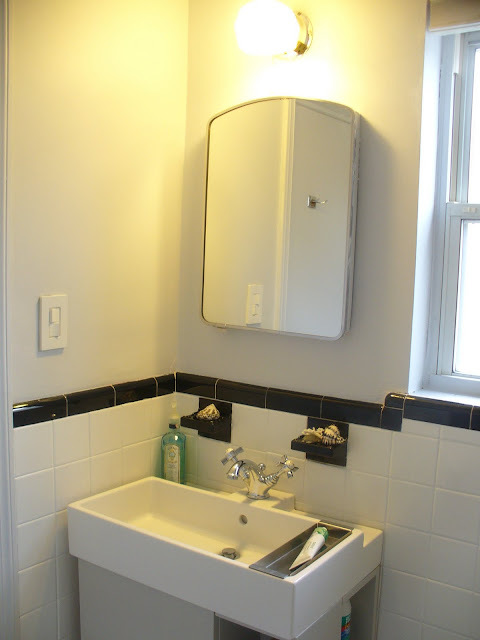 For a number of years, we seriously considered having the bathroom gutted and completely redone. These 1950's ceramic wall and floor tiles are set right into mud and typically take close to two full days to bring down to the studs. My husband has already done so much to the house that asking him to do this wasn't an option and contractor quotes for the demolition alone ranged from $1,500 - $4,000. Plus, I really like the look of the old black bullnose tiles. In fact, if the pink tiles had been white I wouldn't have even considered demolition. 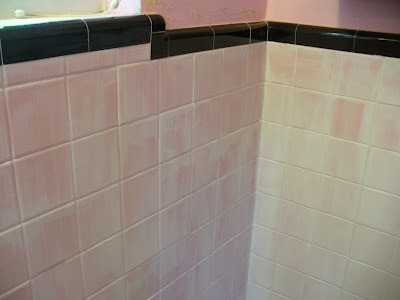 Since I had a successful experience painting the trim tiles in our hall bath from ugly seafoam green to gray, I decided to paint the pink tiles white. I used two thin coats of Sherwin Williams Prep-Rite Interior/Exterior Bonding Primer and two coats of Benjamin Moore Decorator's White. I know there are specially formulated paints for ceramic but I didn't want to be exposed to the fumes. Plus, these tiles won't regularly come into contact with water. For years I had kept my eye out for a narrow vanity. This year Ikea came out with the Lillangen, which offers both concealed storage and creative two-sided open storage. This model is 24"w x 16"d x 36" h. I bought the beech version because I find the wood finish is easier to paint than the white melamine option. The cabinet is painted Farrow & Ball's Pavillion Gray and the walls and ceiling are Benjamin Moore's Bunny Gray. The floors are 1 x 1 Bianco Carrara honed marble surrounded by a border of 3 x 6 honed subway Bianco Carrara. I don't have it pictured here but we had a Panasonic Whisper ceiling exhaust fan installed. 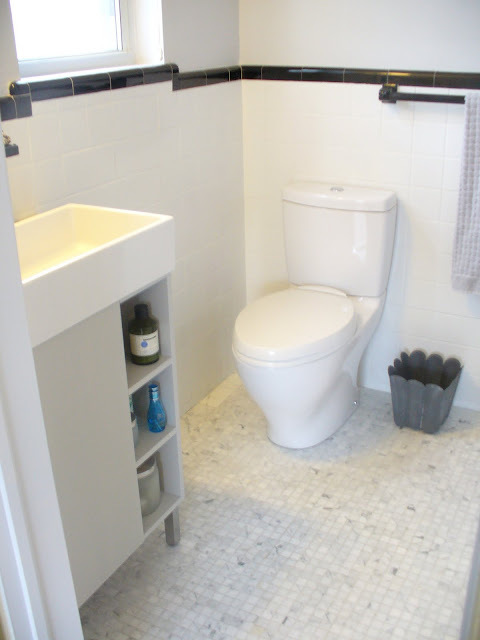 We were so happy with the Toto Aquia Dual Flush we put into our hall bath that we used it again here. The Ikea sink only had one opening and I wanted to avoid a single lever faucet so I chose Porcher's Reprise faucet in chrome. The handles are labeled hot and cold and they have a nice feel to them. Off to the left is a Bombay Saphire gin bottle converted into a soap dispenser. You might notice the faucet is off center by about a 1/2 inch. I forgot to take into consideration the cold water valve when measuring! I have to admit when we first installed the sink, I wasn't sure I liked it. However, it's extremely functional and there's no longer complaints on my end about water puddles left on the sink counter. So in the end, I really like this style for our narrow bathroom. Here it is with the tray - which is how we really use it. It provides a convenient place for toothpaste and to set down things, etc. What's Still Left to Do: A bit of pink still remains! In the spring I will hire the same company that reglazed our hall tub and have them do the shower tiles in white but keep the black tiles so it will be consistent with the rest of the bathroom. I'm waiting till warmer weather because I want to be able to have all the windows open, with fans blowing out all the fumes created when reglazing is done. 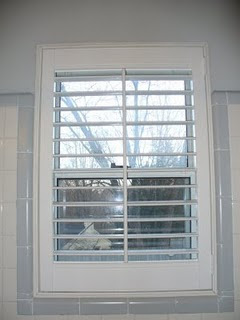 The window needs to be treated and I'm planning to have white vinyl plantation shutters installed. Here they are in our hall bath. The gray trim tiles were seafoam green before being painted gray. 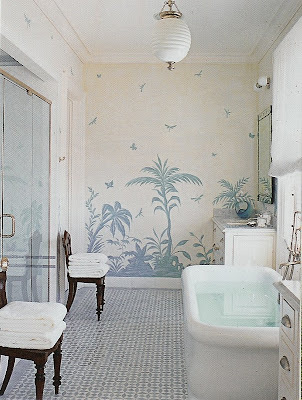 Since the walls are looking a bit plain, I'm planning to stencil them for interest and am inspired by this bathroom by Phoebe Howard. Still haven't found the right stencil yet. Total cost so far: $2,931. 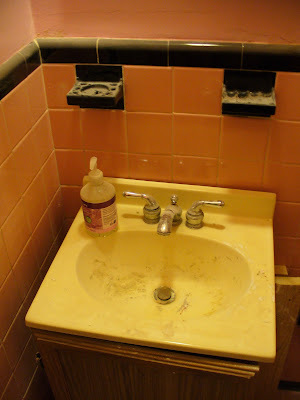 Hope this post was helpful for anyone considering another option besides demolition of an outdated bath and that you've recovered from those pepto-pink before photos! Michele- you've done such an awesome job so far!! The floors are incredible and I love the Ikea sink. You can't even tell the tiles used to be pink and it's so great that you worked and can't wait to see the stencil!!! Wow! This deserves a standing ovation. Truly. I have to second Lauren, I love that you made the best of what you had. The floor is beautiful and the sink seems like the perfection solution for your situation. And personally, I think the little stainless tray is the icing on the cake! Wonderful transformation. Fantastic! I have two of these old 50's style bathrooms. One in pink and gray and the other in maroon and sea foam green. Thanks for the inspiration. Just stumbled on your blog and I love your informative posts. I just finished renovating my home last year and did a lot of my research online. Before and after photos are very inspirational. Will be going through your archives. Thanks for sharing! We have lived with the most incredibly awful bathroom for 12 years. Your s is paradise in comparison!!!! What inspiration I now have. Will clear it out and get started on painting next week. Thank you for the ideas. Hi Lauren, I'm a relative newcomer to your lovely blog. 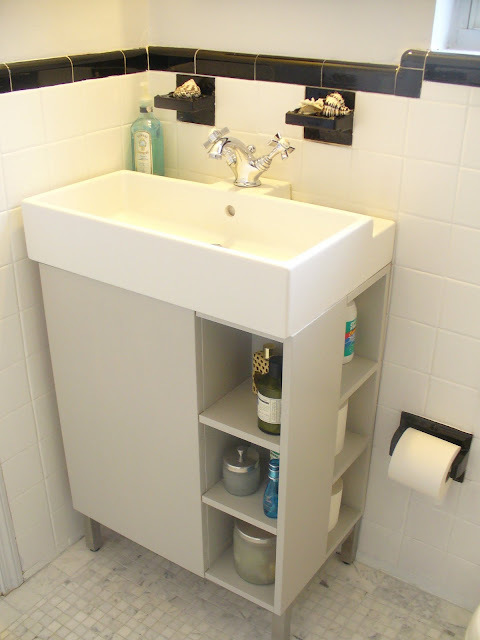 So glad to hear you are happy with this IKEA vanity as it's the same one I have earmarked for our ensuite facelift. We have a bathroom that looks exactly like that only yellow. I am loving that sink for the tight space. The floor and wall tile all look so fresh now. The transformation is amazing! Job well done! I love the vintage feel of the space and the tile you chose for the floor is one of my favorites! This is a great example of sticking to a budget and making something beautiful. heck, you (michele) deserve a visit from me (pve) with my brush and lovely pale gray paint for a simple stroke of genius to match you bath decor. Clearly, you rock when it comes to making the best, to finding the silver lining. just you wait, ding dong. I have the perfect design in mind. Amazing!! Love the transformation and I can't wait to see which stencil you choose! Beautiful job...PERFECT to keep the original tile, too! She did a beautiful job. What an amazing difference. We just installed the Panasonic whisper fan in our daughter's bath...what a huge improvement! Wow- this is great inspiration for someone like me who still has a blue tile 50s master bath. I love the floor tile and the sink is wonderful! I love this! Michelle did such a fantastic job. 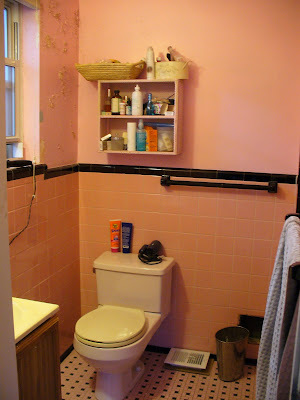 My mother has the same pepto-pink in her guest bathroom and I'm excited to help her paint them now. Thanks for posting this overhaul! fantastic job! and the gray touches are pure genius! What a difference. Those pink tiles are everywhere in MD! What an amazing transformation....looks great! Looks great, Michelle. 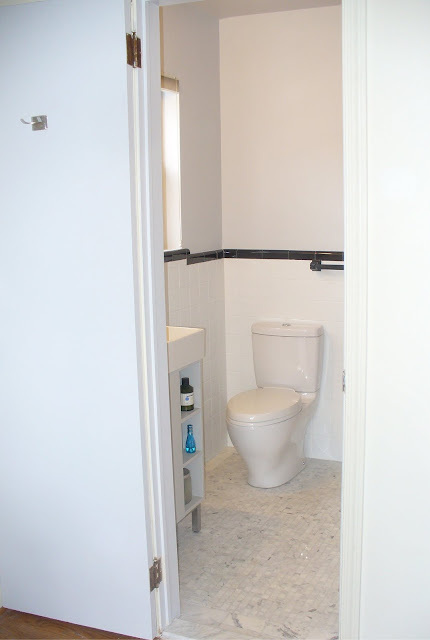 Love your use of white in this small space. Check out www.theperfectbath.com for more inspiration! Look forward to seeing the shower transformation as well. Michele, may I suggest that you select a fabric for your window (a Roman shade would be ideal) BEFORE you paint anything on the walls? The Dahlia in Dove or Aegean might be fun and would suggest towel colors and other accents for your lovely new bath! I have run across so many people with similar tiles and they just live with them because replacing them is such a chore. Your solution is perfect! I can't believe how well the wall tiles turned out. I'm sure it will look even better with your final touches! Love it! What an awesome re-do!! We're about to re-paint (they were painted before) our shower tiles because we can't quite afford to rip them all out yet, and this is a great inspiring post! Also, I really thought I was original and creative when I got the idea to paint/stencil a scenic design onto the walls in our bathroom!!! Ha!!! Evidently I am not as creative or ingenious as I thought! WOW! This is AMAZING!! Nothing like a clean, white bathroom! Oooh love the floors! That faucet is really unique, too. Awesome job and totally inspiring! I am so glad that you posted this... I have been thinking about painting our tiles too.. I am wondering if she sanded the tiles prior to priming? There was not a place to leave a comment on her blog. The floor tiles are so beautiful and classic. Really appreciate the inclusion of the breakdown in costs. What a big change overall! Wow that bathroom is beautiful. I love all of the changes. The floor is beautiful. I also love the sink. Thank you for sharing! Interesting blog, the author thanks so much for the interesting explanation!Keep it up, great success! Bloggy wish a lot of good posts! Great post. Just in time ..I am about to do a bathroom. This is amazing- I just sent this post to my friend who just bought a house with the EXACT same bathroom. What was with people using that awful pink color?1? I actually have it too, but since I'm a renter and planning on moving soon I cant see spending money on fixing it. So for now i live with the pink. What an outstanding job and transformation!! I had the same bathroom with the same tile you have. What I figured was that the bathroom walls didn't need to be tiled, this was not a slaughter house for goodness sake! I tore out all the wall tile, papered the walls, put in a lovely sink and toilet and some time later totally retiled the shower. That was 25 years ago so my expenditures are not meaningful. I still use that bathroom and I still like it. This is one fabulous transformation. I never knew you could paint tiles. I am very inspired by this, Michele. It is one lovely bathroom. Your bathroom looks like my master bath. I have baby blue tiles and am thinking of painting them white. Thank you for sharing this make over, I learn a lot from seeing what you have done. The sink is great and I really like it. My sister painted her ceramic tile floors a year ago and the paint holds up really well. I guess I am up to it now. LOL - those are the EXACT same tiles we have in our downstairs bathroom - right down to the soap holder and the toothbrush holder! Great transformation! 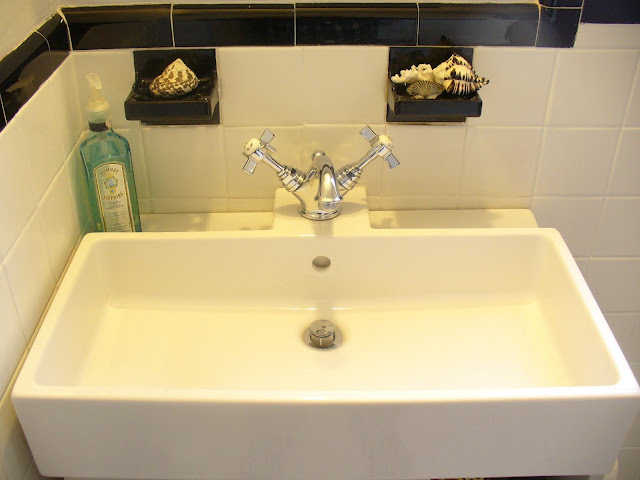 We have the longer version of that sink and I absolutely love it!